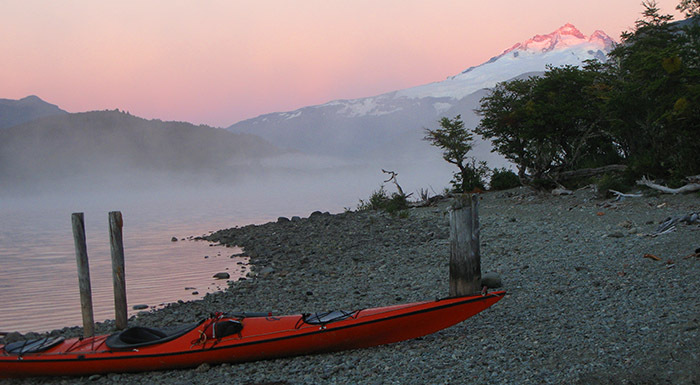 This six day expedition offer you the opportunity to explore the Andes Range by foot traversing the mountains, gaining a summit and then paddling the crystal waters of a glacier fed lake. From Jakob Huts you will attempt to climb a fun peak that may demand some technical snow climbing. 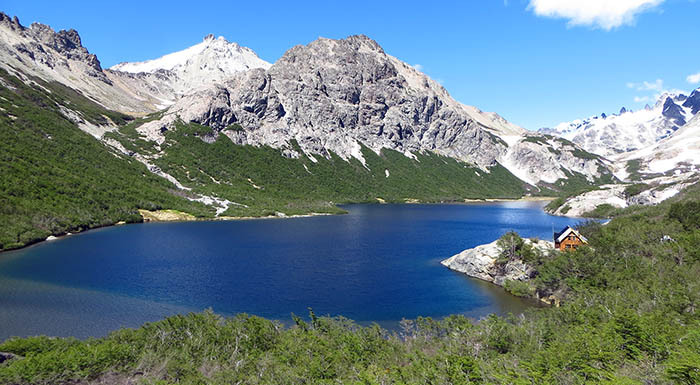 After the summit, you will trek down towards Mascardi Lake where the sea-kayaks will be awaiting you for a exiting two day traverse from the West end of the lake to the East. Day 1: Trek up Cerra Catedral towards Frey Mountain Hut. This is a nice 4 hours trek up a well used path. 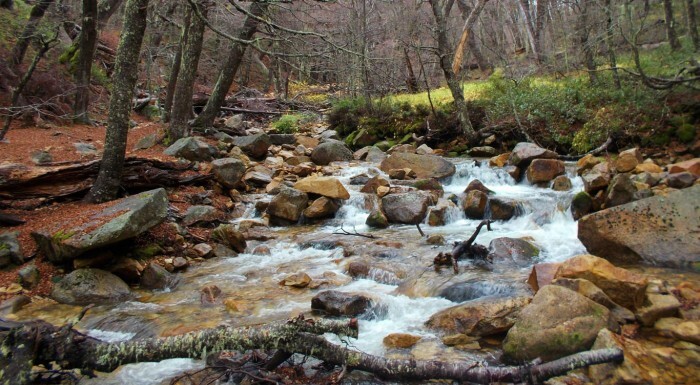 You will be surprised by the alpine scenery at Frey Valley with Toncek Lagoon by the hut. Dinner is served in the hut. Overnight at Frey Hut. Day 2: This is the most challenging hiking day, approximately 8 hrs. 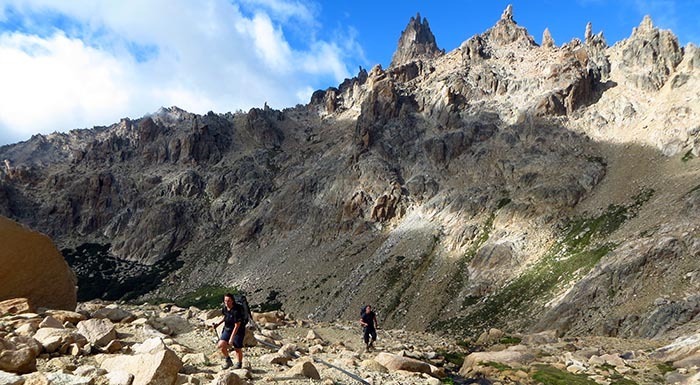 traverse crossing two valley to the West to meet your goal of reaching San Martin Mountain Hut. 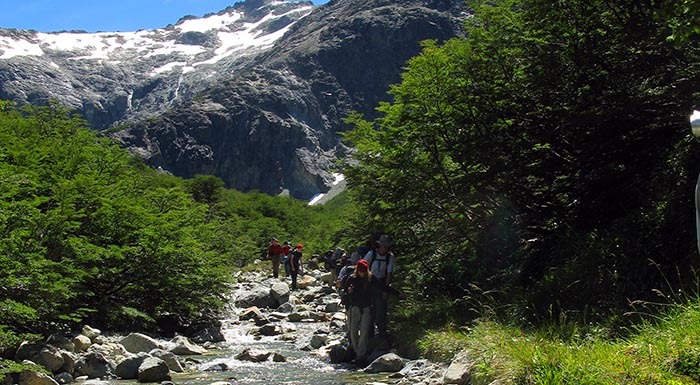 This is a beautiful mountain trek climbing and descending ridges and alpine valleys. Swimming in Jakob lagoon is a beautiful way to relax those muscles. Dinner is served in the hut. Overnight at Frey Hut. Day 3: Alpine start for your summit vid! 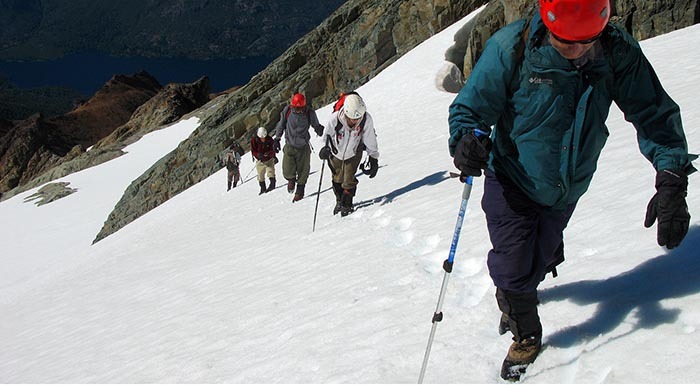 A fun challenge to climb “Cuernos del Diablo” peak. Your headlamps marks the way up the mountain as the sun rises. Slowly gaining altitude the views become more dramatic and beautiful. 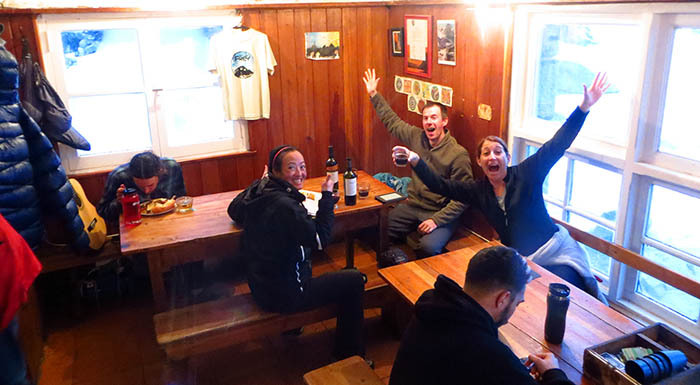 By mid-day you are celebrating at your first Patagonian summit! By mid afternoon, you are back at the hut with plenty of time to relax and rest. Dinner is served in the hut. Overnight at Frey Hut. Day 4: Time to get down from the mountains, using a different valley you follow Casalata creek which flows into Mascardi Lake, your goal for today. A full day trek crossing marshes and old growth forests. Camp will be set by the lake where you will spend the night. Day 5: After a good breakfast it is time for a kayaking skills clinic. You will learn some rescue techniques and paddling strokes. Later, camp is broke down and time to begin sailing the lake towards the East. Paddling those glacier waters is a beautiful experience. Lunch will take place at a desolated island called “Isla Corazon”. 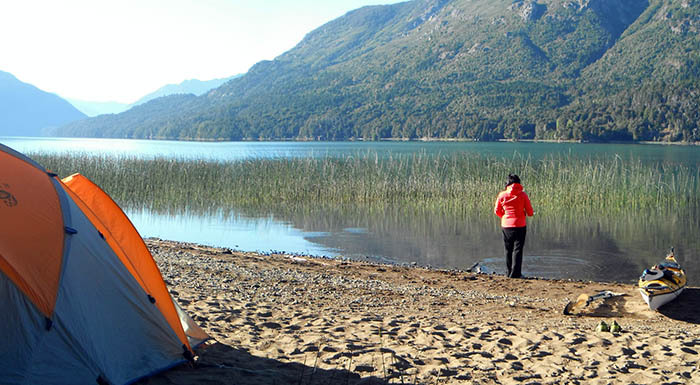 Sometime in the afternoon, we will pick a beach where to camp and spend the last evening below the starts of Patagonia. Day 6: Breakfast is served while you appreciate the calm waters of the lake. Peace reigns. You continue paddling the lake navigating close to it shore where you can see the lake bed. 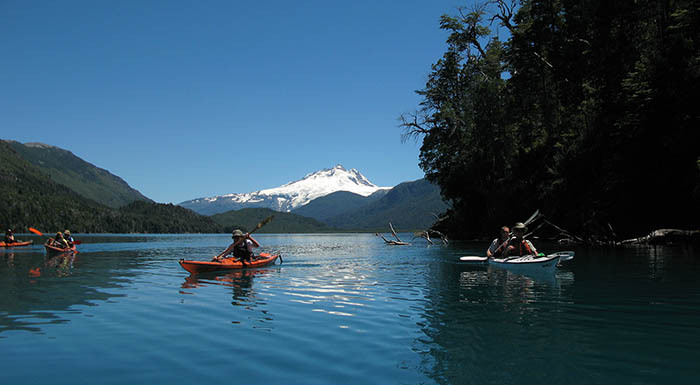 Soon you arrive at the far East lend of Mascardi lake and the culmination of this amazing 6 day expedition. You just paddled 27kms and hiked more than 30 kms! Time to celebrate with a good local beer and a hot shower in Bariloche city!!! Max Altitude Climbed: 2272 mts. Max Elevation gained in a Day: 1000 mts. Camping Equipment for the Kayaking section. Mountaineering Technical Equipment for the climb. All meals during the kayaking section. All Guides expenses at each Mountain Hut.